Our beloved pets with majestic hair can easily get painful mats and tangles in their long fur. All pets can get knots and tangles, but some dog and cat breeds are prone to host a chaotic jumble in their royal coats. Mats and tangles can lead to skin problems and in severe cases, to a situation where the entire coat needs to be shaved or cut off. To avoid this kind of disaster and other health issues, regular grooming and fur care is necessary. 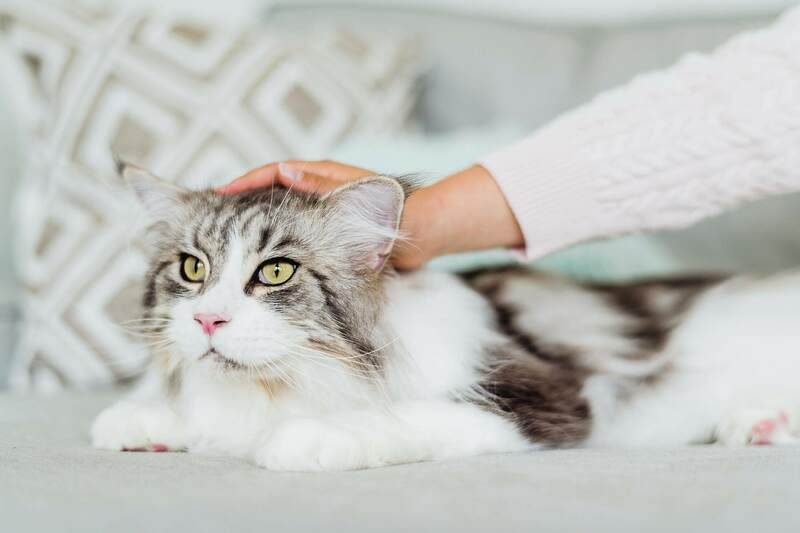 If you are not lucky enough to humbly serve an animal who absolutely LOVES to be groomed and brushed, the following tips might come in handy for you. Consistency is the key in most things — taking care of your pet’s appearance and health is no exception. A quick, daily brushing may save your pet from severe skin problems and other health issues. And the best part? As long as you do it daily, it’ll only take a minute or two! The best way to prevent painful matting and tangled fur is regular brushing. If you run a comb or a brush through your pet’s coat once a day, the fur should stay tangle-free and shiny. Pay special attention and brush spots that are in close contact with grass and soil (under the bum and paws) as well as areas that are often in contact with a collar, harness, or other equipment. Don’t forget to check your pet’s ears, armpits, and the surrounding areas for smaller (but annoying) mats. Beware that some pets consider grooming to be an unpleasant event, and you may need a good strategy as well as plenty of patience for successful results. Want your pet to still love and appreciate you after the mats and tangles are removed? It might be a good idea to let them get used to the brush or comb you’ve decided to use. Especially with cats, make sure they are familiar with the grooming equipment you are using well before starting the untangling mission. Let your pet sniff the brush and leave it out for a few hours (or days, in case you are dealing with an extremely suspicious individual) for them to investigate. Once your fluffy friend understands that the brush or comb (or any other grooming weapon) is not going to attack or try to eat them, brushing will become considerably simpler. Work on small sections of fur at a time. Be gentle. Never stretch your pet’s delicate skin, pull the tangles, or rip them off. Most pet shops are stacked with shampoos (Aptus Derma Care Soft Wash), conditioners and detangling products (Aptus Derma Care Moisturising Detangler) that may help the grooming session substantially. Use omega fatty acid (Aptus Eforion Oil, Aptus Derma Care Premium) and biotin (Aptus Biorion) products for dry skin and brittle fur. Once your pet gets used to pain-free grooming, what seemed like an impossible mission can change into a soothing and rewarding experience for you both, as the process releases endorphins and oxytocin in their body as well as yours. If the matting is out of control and the uncomfortably tangled fur makes your pet’s (and your) life gloomy and miserable, contact a professional groomer and discuss your options. Well-being and health are more important than looks and exterior, so if your groomer tells you the fur needs to go, don’t be upset. It will grow back and your (now funny-looking) companion will thank you for feeling better and healthier.